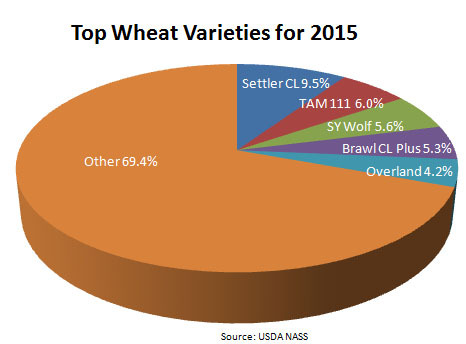 Settler CL was the most popular winter wheat variety planted for the 2015 Nebraska winter wheat crop, according to USDA's National Agricultural Statistics Service. Settler CL was released in 2008 and has gained a large share of the state's winter wheat seedings. TAM 111 was released in 2007 and has moved into second place since 2012. SY Wolf has moved into third place for the 2015 winter wheat seedings in Nebraska. For the 2015 crop year Settler CL accounted for 9.5% of the acreage and TAM 111 6.0%, while SY Wolf was planted on 5.6% of the acreage seeded. Brawl CL Plus moved into fourth place, while Overland fell to fifth place. Settler CL was planted commercially in Nebraska for the first time in 2012 when 64,000 acres were planted. For the 2015 season, 162,000 acres were planted, according to a March 10 USDA NASS news release. For more information on which wheat varieties were planted in which regions of the state, see the full news release, Nebraska Wheat Varieties, on the USDA National Agricultural Statistics Site. For more information on winter wheat varieties, contact the Nebraska Crop Improvement Association or visit the Wheat section of CropWatch, including the Virtual Wheat Variety Tour where there is further information on Settler CL, SY Wolf, and many other varieties.